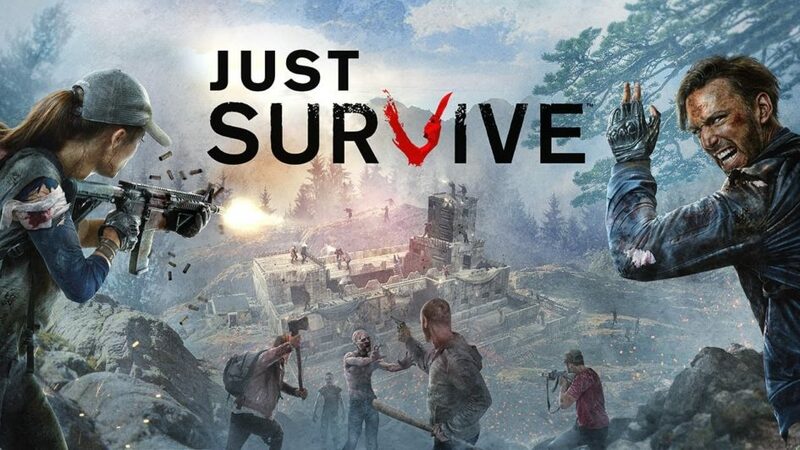 Just Survive is an open-world sandbox survival MMO game for Windows PC that you can purchase on Steam. It’s set against the background of a Zombie Apocalypse and is trying to give you a feeling of living in a world like on The Walking Dead. You begin with nothing and have to scavenge to find food and weapons. You can discover and create better weapons, forage for supplies and even build increasingly bigger shelters. You have to fight off wild animals and, of course, Zombies — as well as other players (if you’re on a PvP server) and just… survive. Originally going under the title H1Z1, it was later titled H1Z1: Just Survive, and is now simply going under the moniker Just Survive. Why? Because the same company also makes the wildly popular game H1Z1: King of the Kill and they were probably tired of issuing refunds for players accidentally purchasing the wrong game. I hear that King of the Kill, a battle royale PvP game, is incredibly fun because my buddy, Jim, keeps trying to get me to buy it so I can play against a group of our friends. Unfortunately, the graphics on both games look like they belong on the PlayStation 2. I felt like I was playing Grand Theft Auto III with Zombies. Stupid Zombies. Stupid Zombies that were mostly avoidable and lacking variety. At least in GTA, when you got too many stars, more and more police would come after you, then SWAT-type police, and then what looked like the FBI. Wouldn’t it be exciting if, the further out you went, you encountered the larger horde and a variety of Zombies? I’m not saying I need all the variety of the Resident Evil games (although that would be cool), but at least give me different levels of decay and some of the creativity shown on The Walking Dead. I’d like to see Zombies with all manner of missing limbs, household items sticking through their torsos and screwdrivers jutting from their heads. Simple things we’ve now come to expect in the Zombie genre. Speaking of venturing out, traveling anywhere takes forever. Sure, you can sometimes eventually get a vehicle, but good luck with that. This ain’t GTA, where I can easily carjack one and go cruising. Hoofing it gets really boring. With the poor graphics, the sightseeing gets repetitive. The extra time does give you more opportunity to spot all the bugs, though. One of the first times I ventured out along a ridge I looked up above the tree line and saw a barrel suspended in mid-air. Just hanging there. This is without even mentioning all the clipping issues with the in-game models, or how if you’re cutting down a tree with an axe or dismantling a car with a crowbar for scraps, your weapon will suddenly turn invisible. Sure, you still have the tool, but there’s no textures. The controls are also clunky and this is not an easy game to pick up. Seriously, I had to look up tutorial videos on YouTube just to figure out how to get started. But the gravest sin? This game isn’t any fun. With all the games out there today, even all the Zombie games, the worst thing you can do is waste my time. Look, I still remember when Resident Evil 4 came out for the GameCube. I was blown away with how scary and how good the graphics looked. But the weapon controls were great and I felt like I had a fighting chance. You’d be better off revisiting your favorite Resident Evil game than this one, even if it’s one of the older Resident Evils for the PS2, the graphics will still be better than Just Survive. If you want a walking dead-style Zombie game, then play The Walking Dead by Telltale Games. If you wanna cooperatively mow down Zombies by the dozens, then boot up Left 4 Dead or your favorite Zombie expansion to Call of Duty. If you want to survive in a post-apocalyptic world, then put in your copy of The Last of Us or Fallout 4. If you think I’m being too hard on Just Survive, then consider that it’s been an “Early Access” release since January, 2015. It’s had more than two years to get its game together. At this point, Just Survive needs to go away, decompose and just… die.